This is the first post part of the second series that is taking place here on our blog. From now on we’ll be sharing with you, our honest and humble opinion of every Hotel we’ll be visiting. We’re starting off with the INAYA Putri Bali. 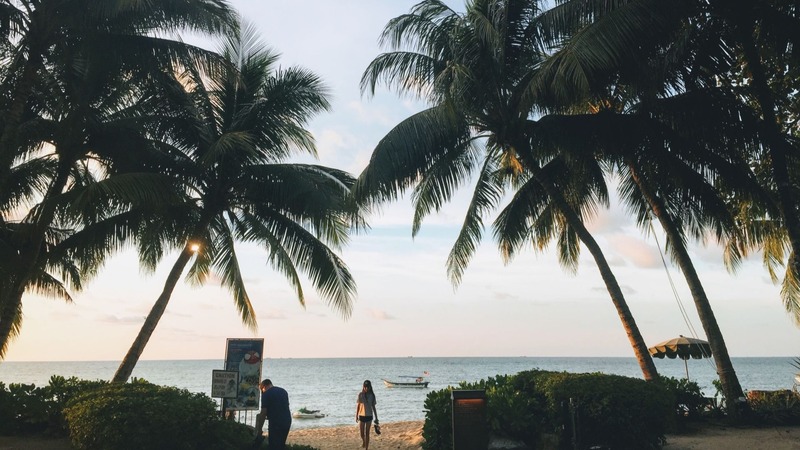 This Asian resort is located on the South-East side of the beautiful tropical island dominated by beautiful white sand beaches. 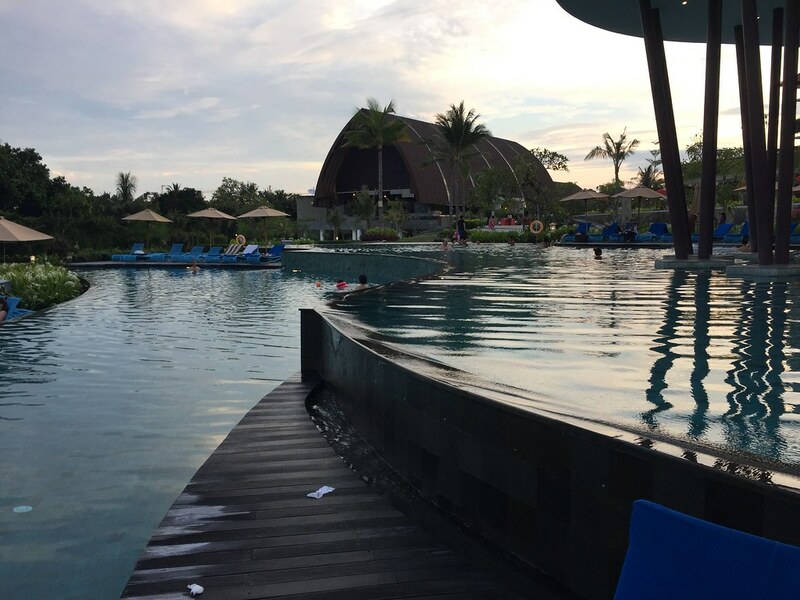 Nearby, there are also many other (more) famous resorts such as Marriot, Grand Hyatt, etc. Nevertheless, the INAYA manages to get its share of voice in this resort-crowded area. While the hotel property itself is not very big, the size was just right for us. There are three on-site restaurants, one three-layered pool (which could count as three separate pools, really) plus two kids pools, a spa and private beach access. There are also some shops and an ATM/money changing service. The pool is three-layered, cascading down to each lower level like a waterfall and absolutely gorgeous! We really loved the fact that there were three levels, as if one happened to be too crowded, we could easily move to a different level, which was mostly quieter. The temperature of the water was also very nice, at times it was perhaps even too warm! Usually, there were enough lounge chairs around the pool, but sometimes it was hard to find a nice shaded place. The beach in the first couple of days was stunning: beautiful white sand, turquoise warm, clear and calm waters and comfortable lounge bean bags under the tree shade. However, after the third day, the water turned somewhat wild, and algae appeared at the shore, so we spent less time at the beach and more by the pool. 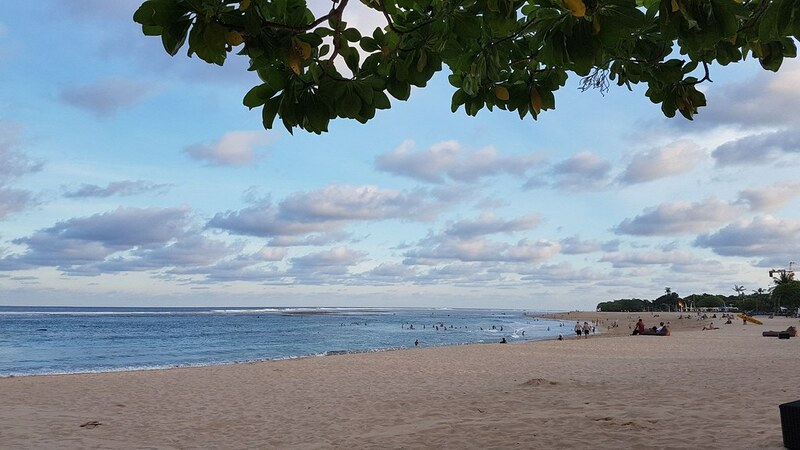 Nusa Dua is known though for having the best beaches in Bali, so if you are looking for the best beach experience, Nusa Dua is the place to go. 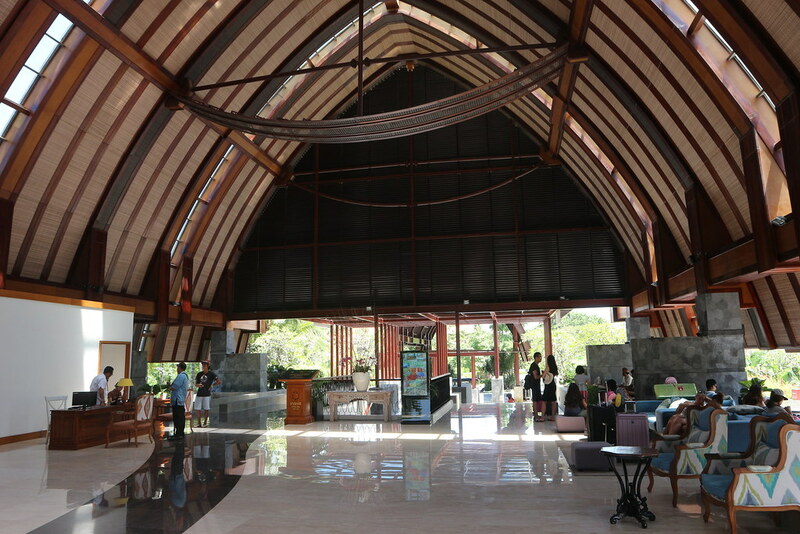 The reception hall is a big building somewhat resembling the wooden skeleton of a big boat turned upside down. As soon as you enter the reception building, the staff greets you with their warmest smile. You can see the whole resort from the reception building, so it’s a very nice view, especially when the sun sets. 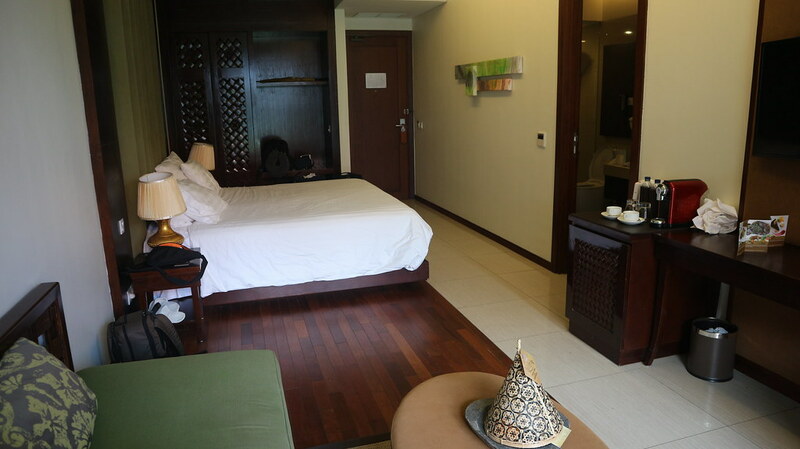 Our standard room was located in one of the eight resort “Puris”, from the reception it was around a 5-minute walk. The room was very spacious, and the fully-equipped bathroom even more so! 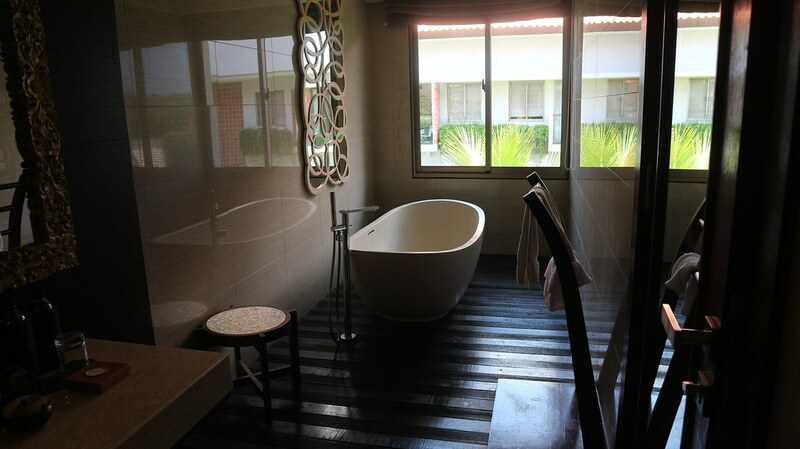 We loved the design of the bathtub on the wooden floor, as well as the big rain shower. There was also complimentary water, coffee and tea, fruits and soft drinks in the mini-bar. The Wifi was very fast as well, around the whole resort actually. The bed was very soft and big as well, with some of the softest pillows our heads have ever felt. 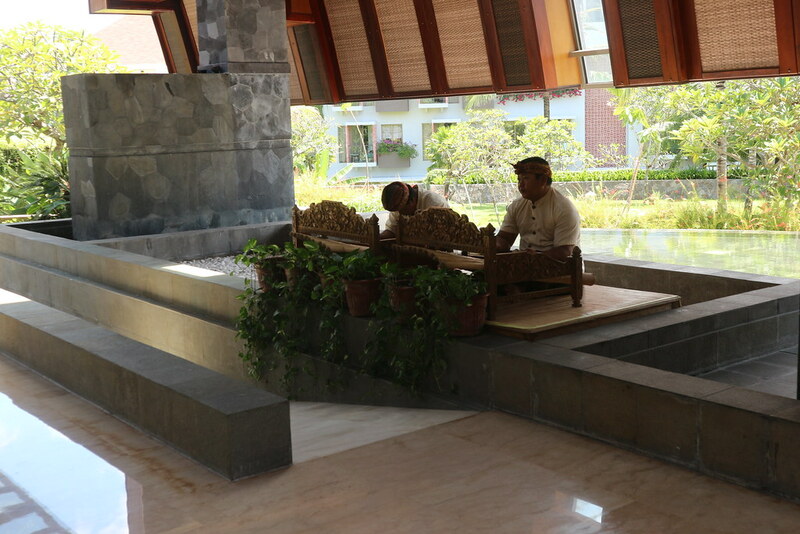 There was also a nice sitting area, and a small balcony, with a view to the garden and the other resort buildings. There were some things that we felt were not up to a five-star resort standards, such as the shower drainage that started smelling after a shower, and also the edges of the shower were a bit dirty. Additionally, at night there was the constant noise of what seemed to be washing machines, which was somewhat annoying. Finally, even though the decor of the room was nice, we found that some of the furniture was slightly damaged around the edges. Even though it is a small thing, we do think that five-star hotel rooms should be impeccable, especially rooms in new resorts. We had complimentary breakfast during our stay, which was always served as a buffet at the main restaurant called Gading. They had most standard western options, such as an eggs station, bread, pastries, sausages, and bacon. 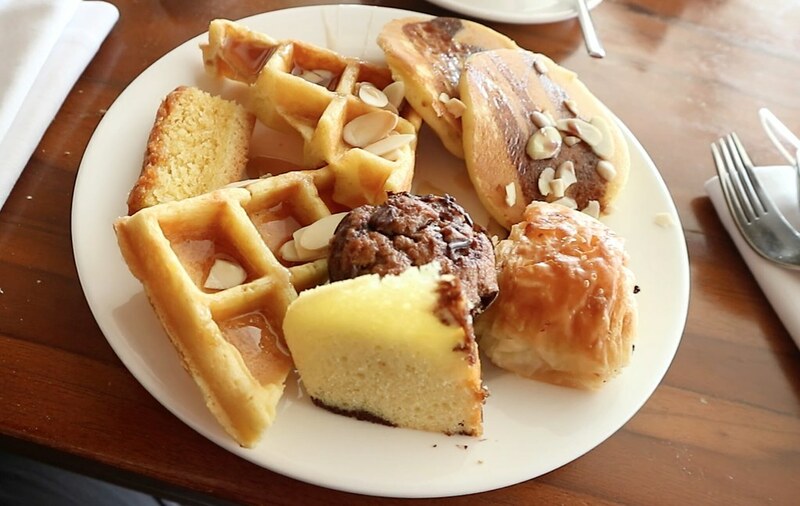 They also had many Asian breakfast options, such as noodles, sushi, rice and Indonesian foods and cakes. They also had coffee, tea, and mixed fruit juices, which we could ask the waiters to bring. The breakfast hall was very big, and as the whole resort ate their breakfast here, it was usually very crowded. As the restaurant was half open, it could get quite hot, even early in the morning, and at times there were a lot of bees around the stations as well. We did appreciate the fact that every day they slightly changed the buffet, such as different cakes and a variation of hot foods as well. 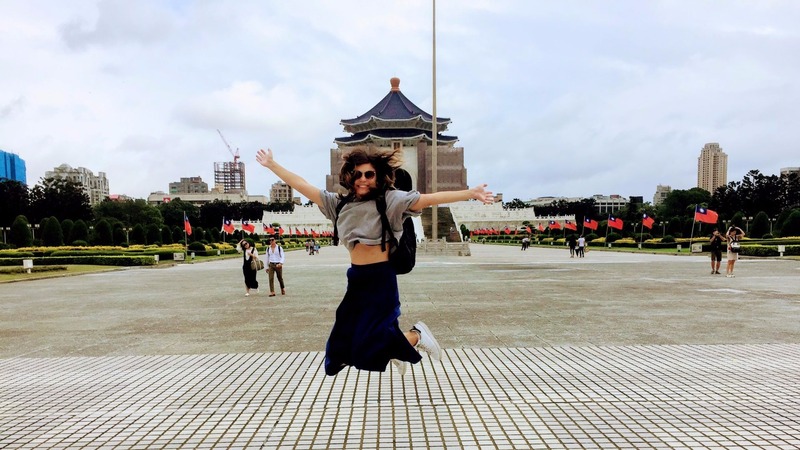 There are three restaurants in the hotel, one serving Chinese and Japanese cuisine, another serving Indonesian food and the other serving Western cuisine. 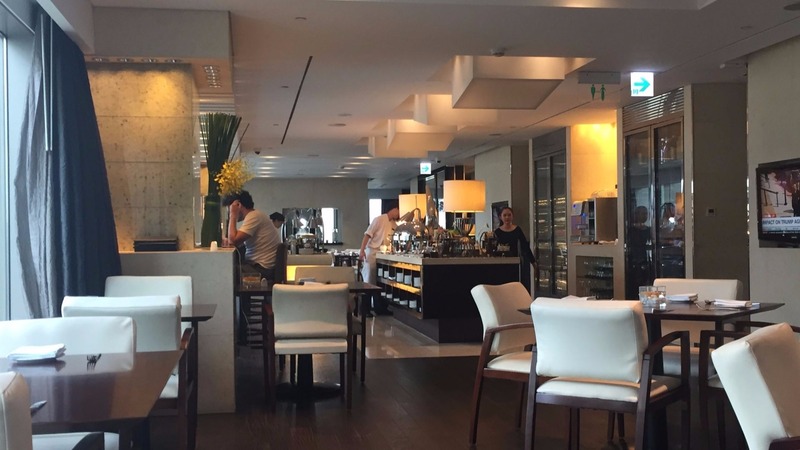 Compared to other five-star resorts, we thought that the prices of the food were very reasonable. At Gadung, the restaurant serving Chinese/Japanese food, a meal consisting of two main dishes, one side dish, and drinks, it was around 30$. The food quality at all three restaurants was good, but nothing very special. We tried all the restaurants, and we think that the Indonesian one was the best, though of course, you can get an Indonesian meal for much cheaper if you go outside the hotel. In one of the surrounding Warungs, in fact, you can get a traditional Nasi Goreng for as cheap as 1$. Overall, we thought the quality of the food was good, but there wasn’t that ‘extra something’ present that could have made it very good or even exceptional. Upon arrival, we were greeted very warmly by the reception, and the check-in process went very smoothly. They even congratulated us for our ‘anniversary’, which gave the welcome a nice personal touch and it definitely showed that the staff reads the notes when you make the booking. 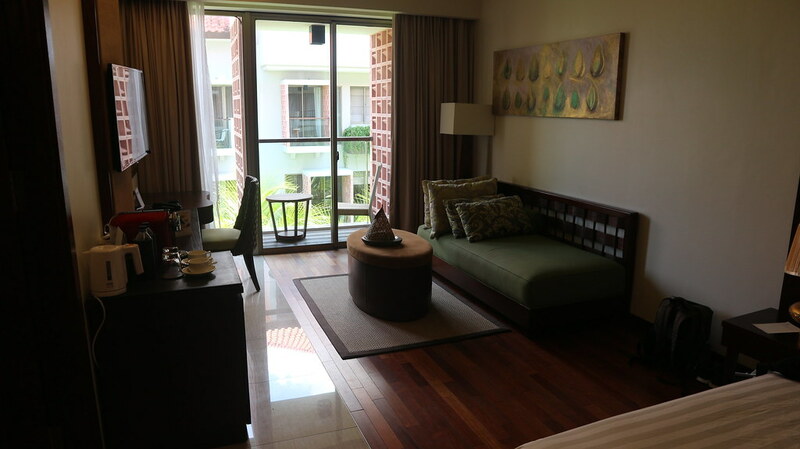 We were brought to our room, and straight away, felt super comfortable. There was a pretty towel heart with flowers petals on the bed, with a note from the hotel manager (hand signed) congratulating us again for our ‘wedding anniversary’ (pretty funny, as we’re not married! ), but it was definitely a cool personal touch. Moreover, when we came back after dinner, there was another nice surprise in our room: A chocolate mousse cake with some candles! That was definitely a really nice (and tasty) surprise. During our stay, all the staff members always greeted us warmly, even when we just walked passed them. Most of them spoke decent English, so there was never a problem with communication. At the beach, it was sometimes slightly annoying that sales people for watersports kept asking us if we wanted to do any activity during the day. We’re not sure if they are an external company or from the hotel, but they kept asking us multiple times a day. 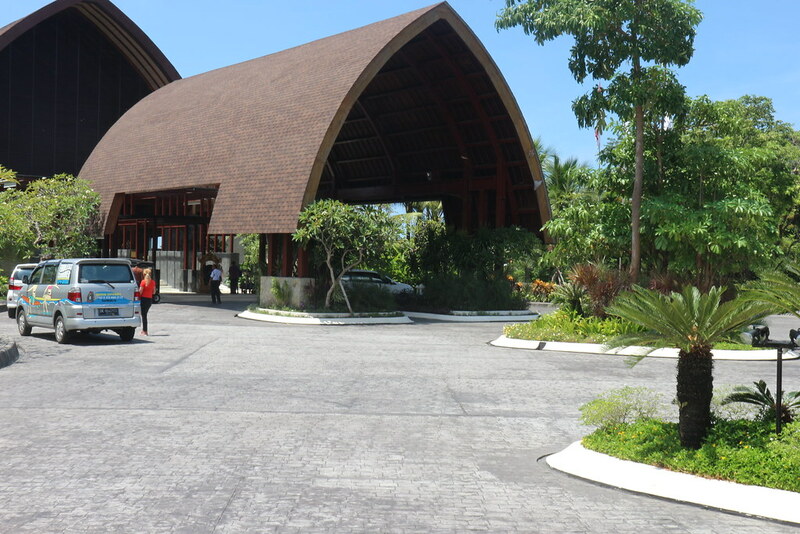 The resort is located in a compound with many other hotels in Nusa Dua, next to a stretch of a beautiful white beach. 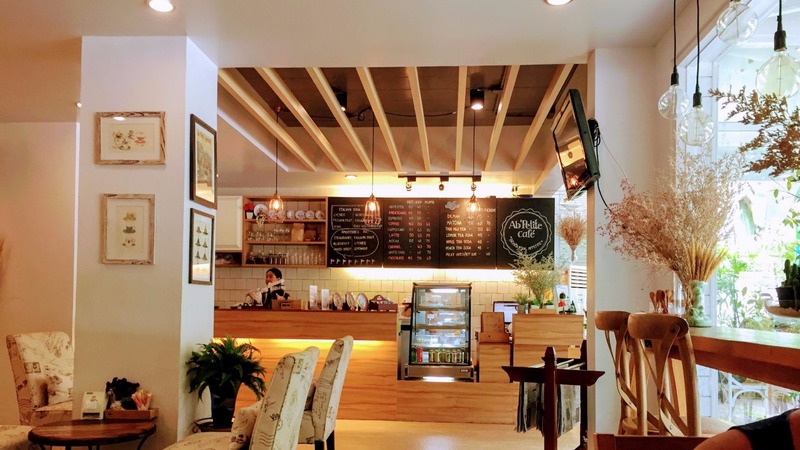 As it is located next to many other high-end hotels, prices for food and souvenirs are considerably higher than the average, and so it can be hard to find a budget place to eat. 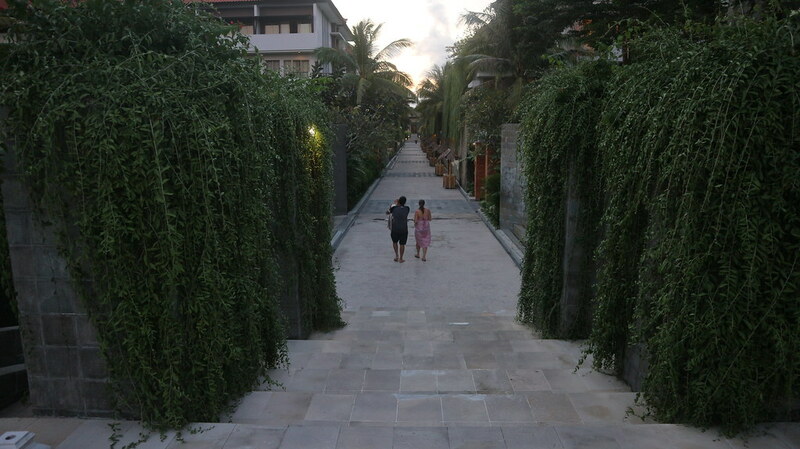 Close to the INAYA Putri, there is a mall called the Bali Collection, where there are some restaurants, which were slightly cheaper than the restaurants in the resort. However, it was still more expensive considering the average, and it felt more like a tourist trap that we didn’t realy enjoy.